Twister’s action revolves around a family of rednecks that get caught up in a huge tornado. The entire town seems to be up in the air, from the RV’s, to the outhouses, gas stations and trucks. Microgaming offers a game in a style which seems a bit retro, more like they were used to be done about a decade ago. The theme is unusual enough and unique as far as I know, so if that’s what you’re looking for you can’t go wrong with Twister. 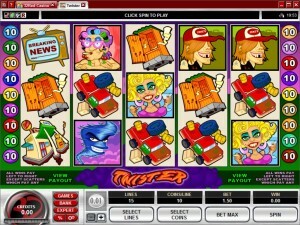 You will find 15 bet lines on Twister’s 5 reels. 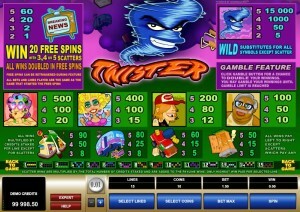 There are also free spins, multipliers, scatters and wilds there. A $37,500 jackpot is the best offer this game makes you. The game has a collection of features which is based on the scatter symbol and the wild. The former will be the trigger for the free spins and multipliers will be coming with them. The Twister is the wild element of the slot, and it’s a feature that feels like the right fit for it. It’s also the symbol which pays prizes of up to 15,000x when you get combinations formed with up to five of them on a line. In case the high value of the top prize isn’t enough to convince you, there is also the matter of the wild’s substitution ability, which allows it to take the place of another symbol when it lands on the right payline during a spin. It doesn’t substitute for scatters, but that’s about it for its limitations. The TV Set is the other major symbol, the one with scatter abilities. What this means is that it is allowed to form its combinations from whatever positions it happens to land in, rather than having to do that from fixed positions on predetermined paylines. You need between two and five of these TV Sets on the reels in order to get a prize, and it will vary between 1x and 60x the total wager. 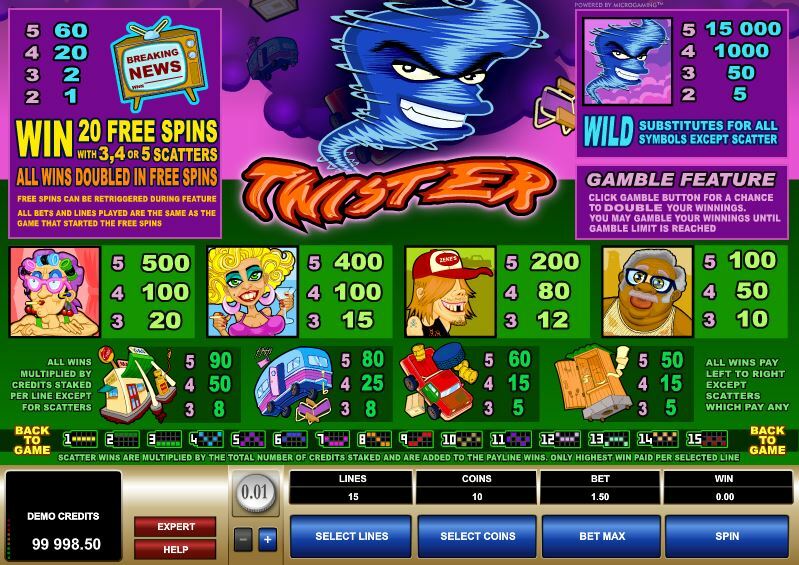 The free spins are also offered in Twister, and they’re typical for such a slot machine, with 2x multipliers applied to their wins. A total of 20 free spins are won when you have at least three TV Set scatters present in the same round. You can retrigger them as well, with another 3+ TV Sets. You decide how many lines are active, how many coins they should get and what those coins are worth. 1 to 15 lines are available for your first decision. Between 1 and 10 coins are part of a line bet. Each coin has a denomination between $0.01 and $0.50. The result is a line bet of up to $5, while the total bet is a maximum of $75. The 7,500x top reward mentioned on the paytable will bring you 75,000 coins if you used 10 coin line bets, while the denomination of $0.50 will mean $37,500 cash in that same scenario. The game seems to have an older design style, which pretty much makes fun of the family of rednecks that is affected by the twister. I’m personally not a fan of the graphics which were used here, but I appreciate the fact that it doesn’t use playing cards at all and overall it’s not an unpleasant game to play. Symbols: TV Set (60x the bet, scatter), Twister (15,000x, wild), Grandma (500x), Redneck Lady (400x), Redneck Man (200x), Grandpa (100x), Gas Station (90x), RV (80x), Truck (60x) and Outhouse (50x). The game has its advantages, mainly when it comes to the theme, the top payouts of 15,000x and the features, but the design isn’t that great. If looks aren’t that important to you when it comes to games, you should try it out. 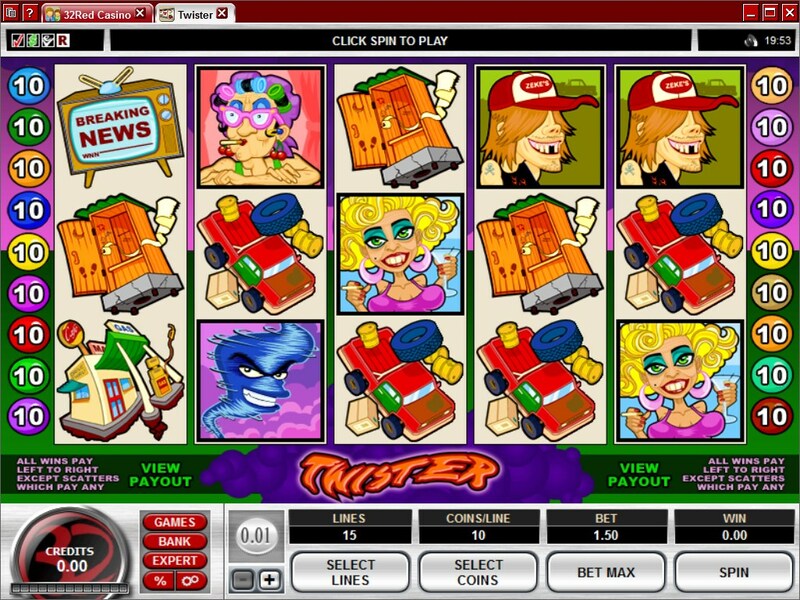 This Twister slot is offered by all online casinos with Microgaming software, playable either in practice or in real money mode.